So long as household chores aren’t counted! Friday, on the way home, I finished the flaps and turned the heels, and picked up the gussets on the blackjack socks. (1 round worked, next round starts the decreases)—no image. Saturday—I felt blah—not so sick as to be really sick, but not so hot either--A general (mild) malaise. As likely as much to do with the short days (and late sun rise) as much as anything else. But I did really have stomach pains for a few hours--and headachee, too. The weather was wonderful (the best day of the week and weekend!) but I had trouble enjoying it. In the evening, I worked on the teal shrug and got one half front finished. I am not thrilled with it--but in 2 weeks the winter will be half over, and I need to finish this up—so it will do. I still have sleeves to do on it—so enough is enough--eventually I will photograph it. And I decided on my next project—the Patons Tam –(which was last month’s knit along project on the Patons blog—so I won’t be knitting along with others--but)—I really like the design—and I hope to knit a few! The tam is worked in 5 colors. This first tam will be Current, Water Chestnut(the two colors in my Peachy sweater) Wisteria (a pastel purple) Royal Purple (a deep purple) and Lemon Grass—a yellow green. I used the same deep purple Patons wool in my February Lady sweater—so in theory—this fair isle style tam will look good with either sweater. Not that I am one for matching clothes. No that is not true—I do like looking well coordinated—with colors (or color families) that match—I cringe at wearing (or seeing others wear) a tomato (orange) red with a cherry (blue) red. I am, tone deaf (really—I have a classic tin ear) but—I have an acute sense of color. And of color memory—I can match paints, and trims, and see colors (depth, shade and other values) in a way that those with perfect pitch can hear note. --My mother recognized my skill long before I did—and often sent me to buy thread or buttons or other notions for the things she sewed—occationally she questioned my choices—but almost always, she realized, that my choices were the right ones. What she sometimes thought as an off-beat choice, was (when looked at in daylight, and in the kitchen (florescent) and under the sewing lamp) actually a the perfect match. So while my style choices are often eclectic, my color choices are very often rigid –no off shades for me! And I like high contrast—the royal purple is perfectly contrasted with yellow, and the peach,, with a shade of blue--the lemon grass is a yellowish green (--and green is yellow and blue) so it is just the right shade to compliment both colors. Tonight—I start the first round of color.. (and then the under band pattern) –and maybe I’ll get a few rows down on the teal shrug front band..
And I should do some laundry—and definitely some meal planning, and I still have pounds of onions waiting to turn into soup, and … Oh I hate household chores! ooh, very cool! I love the colors you've picked. I'll have to go check out the Patons blog now. 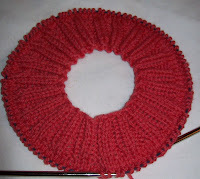 I am anticipating how the tam will look - your choice of colors is great.